Silverleaf desmodium (Desmodium uncinatum (Jacq.) DC.) is a trailing perennial legume that may grow up to several meters long over surrounding vegetation. It has a large but shallow root system. Its stems are cylindrical or angular, densely hairy, and may root at the node in wet conditions. The leaves are trifoliate, borne on 2-7 cm long petioles. The leaflets are ovate, 3-6 cm long, 1.5-3 cm broad, dark green with a silvery midrib at the upper side. The lower side of the leaflet is covered with whitish hairs. Silverleaf desmodium flowers are 1 cm long, pink to bluish in colour as they mature, borne on long paired racemes. The fruits are light brown hairy pods that break readily into 4 to 8 segments at maturity, and tend to stick to animals and clothing. The seeds are olive-green in colour, triangle or oval shaped, 3 mm long x 2 mm wide (Ecocrop, 2011; FAO, 2011; Cook et al., 2005, Hacker, 1992). Desmodium uncinatum is mainly used as fodder. It can be used for pasture, deferred feed, cut-and-carry and hay (Ecocrop, 2011; FAO, 2011; Hacker, 1992). It is also used for ground cover and mulch (Cook et al., 2005). Silverleaf desmodium originated from South and Central America and is naturalized in many tropical and subtropical areas in Africa, South-East Asia and Australia (FAO, 2011; Kretschmer et al., 2001). It can be found within 30°S and 19°N at altitudes ranging from sea level to an altitude of 2000 m in the subtropics, and from 500 m to 2400 m in the tropics (Ecocrop, 2011; Hacker, 1992). Due to its cold tolerance, it does well at elevations where other tropical forage legumes grow poorly (FAO, 2011). Between 10° S and 10°N, Desmodium uncinatum is limited to areas over 1000 m (FAO, 2011). Desmodium uncinatum is a warm season legume but it is also one of the most cold tolerant tropical legumes and can survive frost down to -10°C. Though the leaves may be killed by frost, the plant recovers quickly in warm weather and it is one of the earliest tropical legumes to grow in spring (Ecocrop, 2011; Cook et al., 2005). Optimal growth is obtained at average temperatures ranging between 25 and 30°C. Annual rainfall should be about 1000 mm. Heavy rainfall (3000 mm) was deleterious to its growth in Fiji (FAO, 2011). Desmodium uncinatum grows on a wide range of soils from sands to clay loams, but does better on light, friable soils (Cook et al., 2005; Hacker, 1992). It can withstand moderate acidity (down to pH 5) and soils with high Al and Mn contents. It is somewhat tolerant to flooding and drought (up to 3 months) but cannot stand poorly drained soils such as clays, or soil salinity (FAO, 2011; Cook et al., 2005; Hacker, 1992). It needs high soil fertility, and P, S and K must be applied before sowing and for maintenance. 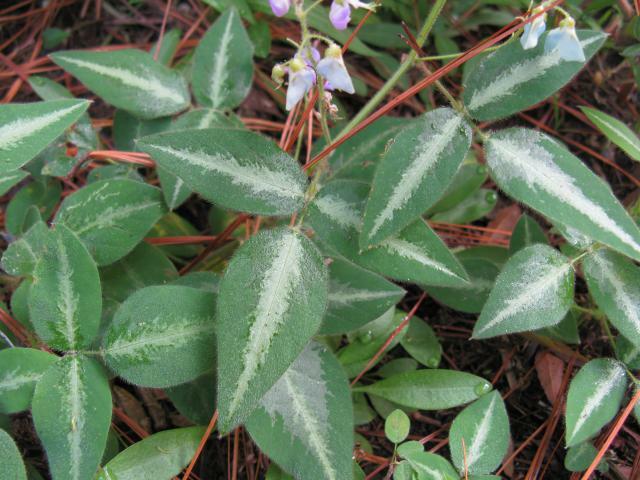 Silverleaf desmodium may recover from fire but fires are not recommended (Cook et al., 2005). 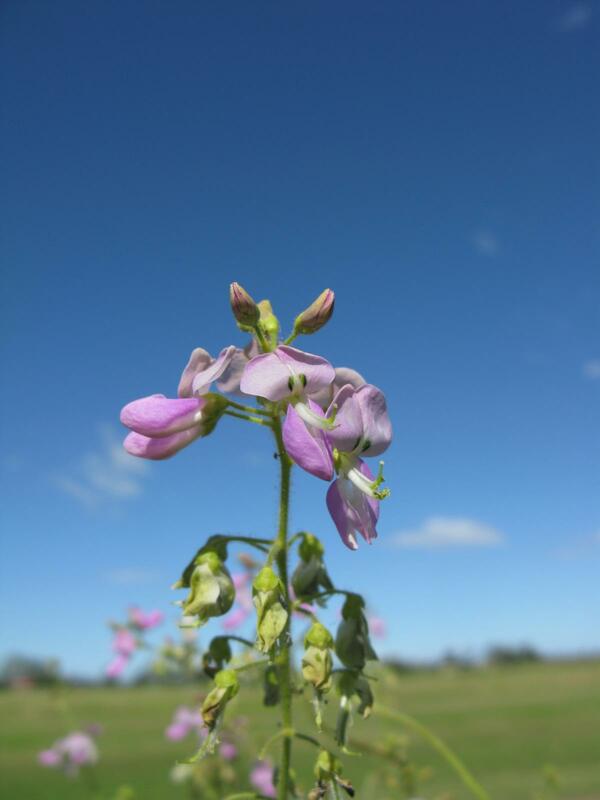 Silverleaf desmodium can be sown in pure stands or in mixed pasture with grasses or other legumes (FAO, 2011). It does well with other legumes such as greenleaf desmodium (Desmodium intortum) and siratro (Macroptilium atropurpureum), and with cold tolerant grasses such as the giant setaria (Setaria sphacelata var. splendida). It can be grown in association with tropical grasses such as Rhodes grass (Chloris gayana), kikuyu (Pennisetum clandestinum) and Bahia grass (Paspalum notatum). However, Desmodium uncinatum can also become invasive, as has been the case in Australia with pastures of signal grass (Brachiaria decumbens), Rhodes grass and Paspalum species (FAO, 2011; Cook et al., 2005). As Desmodium uncinatum does not vigorously establish in the early stages of growth, weed competition should be prevented and it should not be grazed before 16 weeks after sowing (FAO, 2011). Heavy grazing is not suitable. It should not be cut below 10 cm since this can hinder regrowth and result in its destruction. Continuous grazing should be avoided and rotational grazing should include rest periods of between 4 and 8 weeks (Ecocrop, 2011; FAO, 2011). When Desmodium uncinatum is grown with maize, the stover-legume mixture is grazed during the dry season and up to the first half of the following rainy season. Once the stover has been eaten, the legume is allowed to regrow until the end of the rainy season in order to make hay. It is suitable for intercropping with cereals and fodder crops that provide shade and support to its vines (Boonman, 1993). Silverleaf desmodium yields between 3 and 7 t DM/ha when it is grown in pure stands and up to 15t DM/ha for silverleaf/grass mixtures (Ecocrop, 2011; Cook et al., 2005; Jingura et al., 2001). Silverleaf desmodium is an N-fixing legume that improves the soil N status and can provide nitrogen to neighbouring crops. It was estimated that the amount of N fixed ranged from 90kg/ha in desmodium/grass stands, mixed on a 3:7 ratio, to 110 kg N/ha/year on pure stands (FAO, 2011). Silverleaf desmodium is considered a weed in Australia and Hawaii because it can outcompete native species (AWC, 2011; US Forest Service, 2011). In association with a maize crop, silverleaf desmodium may help in controlling Striga hermonthica, a deleterious parasitic weed of maize, due to an allelopathic action (Labrada, 2003). Silverleaf desmodium has a relatively poor nutritive value for a legume. Its protein content is in the 12-21% DM range, with an average of 15% DM, and it contains very high levels of lignin and fibre (more than 40% ADF). However, this anomalous fibre level could be an artefact of the high tannin content, as it has been observed in other legume species (Reed, 1986). Silverleaf desmodium contains large amounts of condensed tannins: values in the 9-17% DM range have been reported (Baloyi et al., 2001; Getachew et al., 2000; Mbugua et al., 2008). The condensed tannins were more concentrated in the leaves than in the stems (Baloyi et al., 2001). This high tannin content may reduce palatability and the nutritive value of the forage. Minute amounts of saponins (Baloyi et al., 2001) and oestrogens have been reported but the latter do not seem to cause adverse effects in grazing animals (Bryan, 1969 cited by FAO, 2011). The OM digestibility of silverleaf desmodium is rather low (48-57%) and even much lower values have been recorded (19%, Mtimuni, 1978). 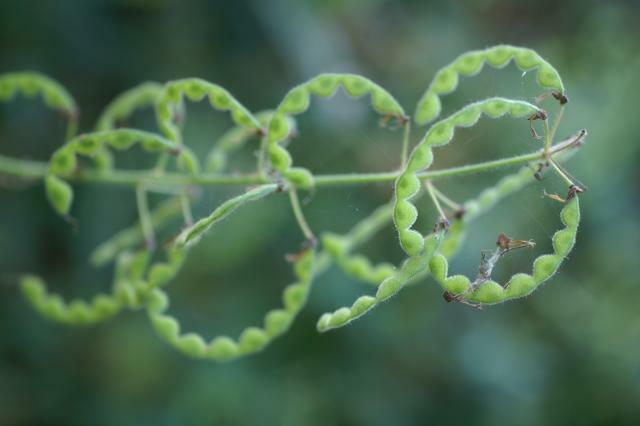 However, the true intestinal digestibility of DM, nitrogen and amino acids was higher for silverleaf desmodium than for cowpea (Vigna unguiculata), and rumen-undegraded protein supplied postruminally could be used for productive processes such as milk production and growth (Baloyi et al., 2009). Due to its high tannin content, silverleaf desmodium would be better fed only at low proportions in the diet. Feeding after drying may be advantageous because the amount of condensed tannins will have decreased (Baloyi et al., 2001). When used to supplement Hyparrhenia-dominant pastures (veld) in Zimbabwe (25% of forage intake), silverleaf desmodium hay was less efficient than hays from stylo (Stylosanthes guianensis) and siratro (Macroptilium atropurpureum) for increasing intake, digestibility and live-weight gain in growing lambs (Matizha et al., 1997). 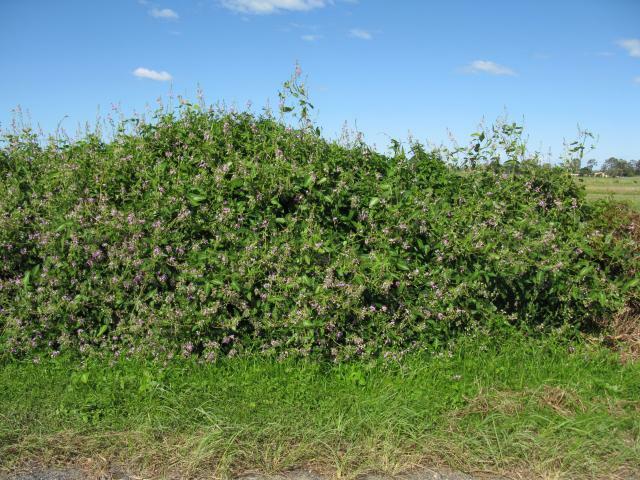 In a similar experiment, silverleaf desmodium hay also resulted in a lower intake than cowpea (Vigna unguiculata) and Stylosanthes scabra hays, though DM and OM digestibilities were identical to those obtained with those legumes. The 3 legume hays increased DM and N utilization but N retention remained negative (Baloyi et al., 2006). During a series of experiments in Zimbabwe in which steers grazed veld sown with silverleaf desmodium for several years, dry season weight losses were significantly lower and wet season weight gains were higher than in steers grazing unimproved veld. Early growth was grazed hard. Even when only the bare stems were left due to frost they were able to increase the protein content of the diet. However, the legume induced botanical changes resulting in weed invasion. 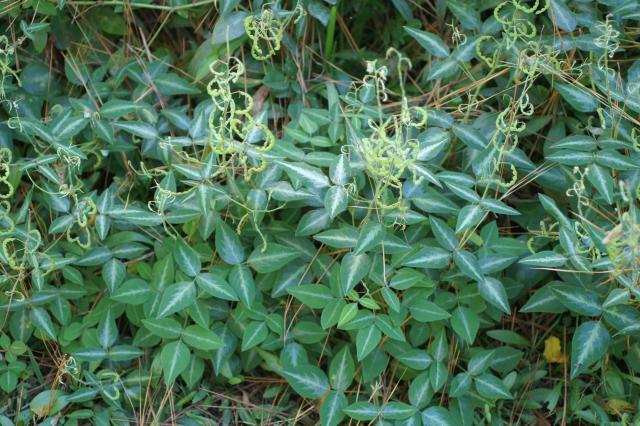 In winter, the silverleaf desmodium pasture lost part of its nutritive value, due to trampling and frost, and it was proposed to use legume trees such as Leucaena leucocephala instead (Clatworthy et al., 1980a; Clatworthy et al., 1980b; Clatworthy et al., 1980c; Clatworthy, 1984). The substitution of maize by silverleaf desmodium leaf meal in broiler diets was tested by several authors, and resulted in a decrease in growth perfomance and feed efficiency at levels of 6% in starter diets and 10% in growers (Teguia et al., 2002). In layers, leaves of Desmodium spp. were found to promote egg pigmentation without affecting laying performance (Teguia, 2000). Hacker, J.B., 1992. Desmodium uncinatum (Jacq.) DC.. Record from Proseabase. Mannetje, L.'t and Jones, R.M. (Editors). PROSEA (Plant Resources of South-East Asia) Foundation, Bogor, Indonesia.